When you travel to Fez, you not only travel to a busy Moroccan city, but also travel 1,000 years back in time. The modern world has barely intruded into the warren that makes up the medieval medinas (old quarter) of this ancient city. In this old quarter most of the city's main tourist attractions can be found. 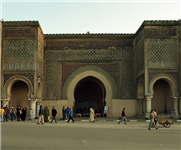 There are several gates allowing entry to the ancient town of Fez: Bab Bou Jeloud, the western gate, has bright decorations and hotels and cafes grouped around it; Bab Er Rsif is the central gate, opening onto the square in front of the mosque of the same name; Bab el-Ftouh is the southeast gate giving onto the cemeteries; and Bab Guissa, the north gate, lies on the hillside close to the Merenid tombs vantage point. 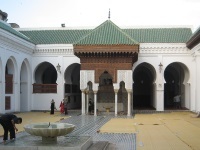 The principal entrance for tourists is the Bab Bou Jeloud, which was constructed in the modern era in 1913 but appears older because of its tiled facade. Anyone in love with tales of Aladdin, Ali Baba and the Arabian Nights will be drawn to holiday in Fez, but the reality of the sights, sounds and smells may come as a shock to visitors. However, there is certainly beauty to be found. Travellers willing to plunge into the sensory overload will be richly rewarded, but should emply the services of a tour guide.